Food Costs > How Much Do Tamales Cost? How Much Do Tamales Cost? A tamale is a Latin American dish that consists of a corn-based dough that is steamed. These tamales can be filled with various fillings such as meats, cheese, vegetables, sauces, and more. Originated as early as 8000 BC, tamales have always made a great, portable food. The cost of a tamale is going to vary depending on who is making it, your location and where you purchase it from. On average, most tamales are going to be sold in a package containing a dozen or sometimes in a pack of eight; tamales are not often sold on its own usually. A dozen tamales are going to cost anywhere from $7 to $19. A single tamale at a local restaurant or food truck can cost anywhere from $1 to $3, while a box of commercially processed tamales can cost about $3 to $6 per box. For example, TheTexasTamaleWarehouse.com sells pork, beef, chicken, vegetarian, and tamale salsas. Their prices range anywhere from $5 to as much as $16 per dozen. According to this OC Weekly article, the average tamale sold at a local farmers’ market is about $3. In that same article, the Latino Health Access tamale fundraiser said the going rate for a dozen can be about $20. Even though the ingredients are at a minimum, tamales tend to be expensive since they are labor intensive and can be one of the most aggravating things you do in the kitchen. A tamale chili or salsa can cost anywhere from $15 to $35 per five pounds. These generally come in a sealed container that is pre-mixed. Pepe’s Tamales, a popular restaurant in Texas, for example, charges about $14 per dozen or $7 for a half dozen. Each one is around $1.25. The Tamale Store, located in Phoenix, Arizona, sells theirs for $7 for a two pack or $35 for one dozen. Tamales in a can, which is similar to a canned pasta, can cost about $1.50 to $2.50 per 12-ounce can. Popular brands include La Preferida and Hormel. Tamales come in many various forms and can be made from just about anything. It’s made from a corn-based dough and can commonly be found filled with chicken, pork or beans. They will come packaged together in a leaf paper, such as a corn husk, and will be held together using a string. They will be square in shape and the size of an average man’s hand. Those who purchase them online will simply have to place them in the oven or boil them upon receiving them. Purchasing tamales online may incur additional shipping costs. Since these tamales will have to be shipped with dry ice, it is best to check the company’s policy on their shipping. Boil in bags, steamers or a tamale pot is considered the best way to cook a tamale at home if you decide to purchase one online or a local market. These bags or steamers will cost extra, usually less than $10 to $20. Most tamales are sold alone. All extra ingredients needed for your recipe will have to be purchased separately. While optional, some prefer adding a pinch of sour cream or salsa to their tamale if isn’t already included. However, most people prefer to eat as is. When preparing them, always make sure you have the husk to cook them in. Even if you can’t find them locally, always research the reputation of the company you’re purchasing from. Common ingredients that are going to be needed in order to make a tamale are going to include chili powder, onions, garlic and meat such as pork and beef roast. 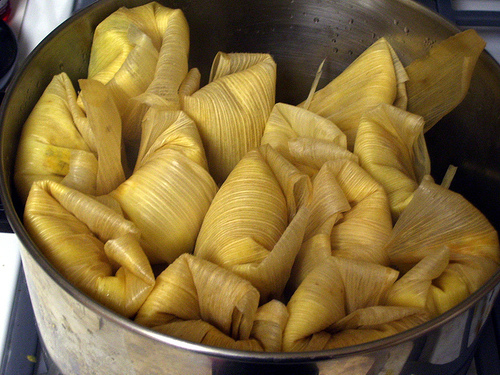 The best way to reheat tamales is by filling a steam with 1/4 water and setting the heat to medium. Arrange the tamales around the edge of the steamer with the open end up. Continue to steam for 20 minutes if they were refrigerated or up to 30 minutes if frozen. Some people think a crock pot could be the answer; however, a crockpot won’t reach the temperatures when compared to steaming. Do you eat the corn husk on a tamale? This is a popular question some may people often wonder when they see a tamale for the first time. The corn husk is designed to hold the masa in place while it cooks to perfection. To put it in simple terms, the husk shouldn’t be consumed; however, it won’t harm you if you were to consume it. To eat a tamale, simply peel it open, grab a fork or spoon and enjoy. The more you purchase, the more you are going to be able to save with most sellers. Local Mexican food markets are generally the best place to get the best price.